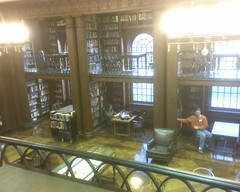 This is one room in the Yale Divinity School library. Some are tempted by, say, a Lexus. This is my temptation . My version of heaven. Great shot. Yale has some great collections. Thanks for sharing this! Cool. I spent many hours in that room. I was probably more productive in the ‘bowels’ of the library (basement–no windows, concrete, surrounded by metal, utilitarian shelves, etc–check those out), than I was in that reading room, just because it was so beautiful and distracting in that room. By the way, Gregg, I sent you an email, but perhaps you’re not checking it–but my friend Mark has invited you over to our old house (just four blocks from that library). I’d love for you to meet him and to see our old Community House. You can email him at mark.totten@yale.edu or call at 203-772-1374, or drop by at 192 Mansfield Street (google map it). If you’re walking, head down the hill on Prospect from YDS, take your first right (Hillside) and then your first left (Mansfield). It’ll be the sixth house on the right. There are two porches–Mark’s is on the right (ours was on the left). Hey Corey, I did get to meet Mark and Kristin. What great people, and what a gorgeous house. Good work, and thanks!